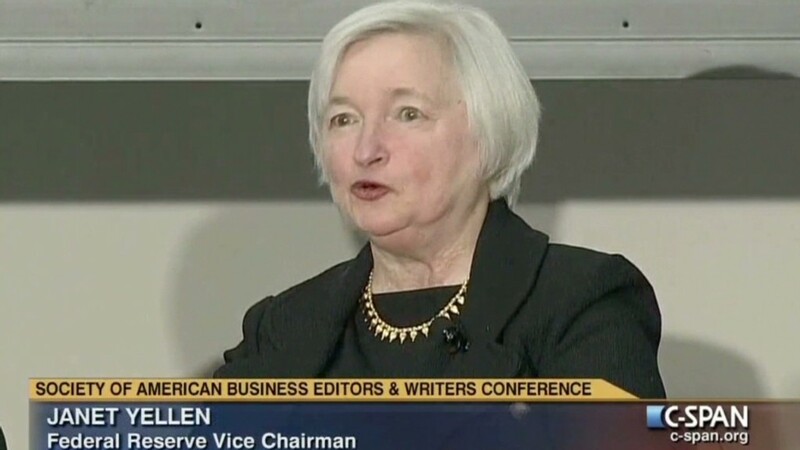 Female economists: Pick Janet Yellen for Federal Reserve chair, but leave gender out of it! Janet Yellen is the best candidate to succeed Ben Bernanke as head of the Federal Reserve, and gender should have absolutely nothing to do with it. That's the overwhelming consensus from a CNNMoney survey of top female economists. Last week, we sent a questionnaire to 100 female economists in academia and the private sector, several who have worked with Larry Summers and Yellen in the past. We asked them to choose: Which of these two top contenders is their preferred candidate for Federal Reserve chair? Also, will gender have anything to do with the decision? 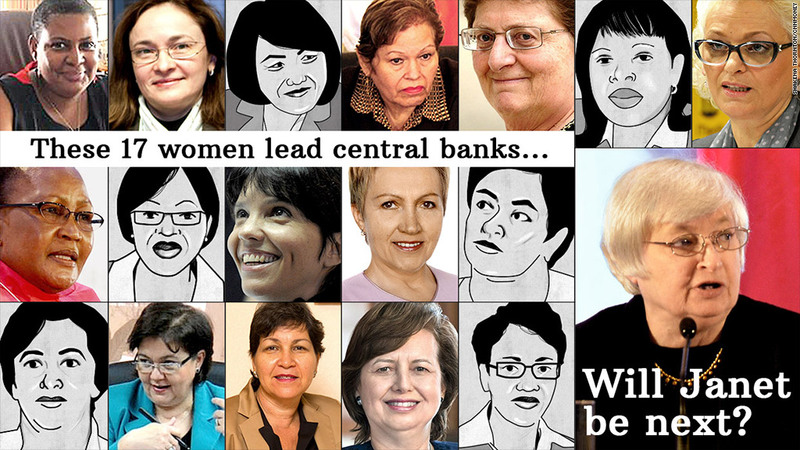 A woman has never led the Federal Reserve, and worldwide, only 17 of 177 central bank leaders are women, according to the Central Bank Directory. In order to encourage candid responses, we also gave the economists the option to remain anonymous. Of the 45 economists who responded to our survey, 38 said Yellen should get the job, and one wrote-in that she would like former Fed chair Paul Volcker to return to the post. The remaining six participants declined to make a recommendation, with some noting they felt both Yellen and Summers were qualified for the job. However, not one economist threw their full support behind Summers alone. "Yellen is the most qualified candidate. If she doesn't become Fed chair it will be, in part, because she is a woman," said one respondent. "I don't think it would be because of overt discrimination. Rather, there is more subtle bias -- she is not a friend of the decision makers; a woman who is not aggressive is perceived as weak, whereas a man who is not aggressive is perceived as a thoughtful consensus builder." But she is not as well connected to the White House as Summers, who was Treasury Secretary under President Clinton and also the head of President Obama's National Economic Council. Several economists we surveyed perceived this as a big hurdle for Yellen. Summers, 58, has his Ph.D. from Harvard. In addition to having Treasury Secretary on his resume, he is also well-known for being president of Harvard University (did you see "The Social Network?") and as one of the architects behind President Obama's 2009 stimulus package. Of the 38 economists who said Yellen should get the job, 10 said they thought President Obama would nominate Summers. "The old boys will make the call, and I think they will pick their insider," one survey participant said. But many of the economists we surveyed stressed that Yellen is the better candidate because she has more relevant monetary policy experience. Whereas Summers spent most of his career focused on fiscal policy, Yellen was number-two in command, as the Fed launched unprecedented policies to stimulate the economy. She has also led the Fed's recent efforts to increase its transparency. Yellen is largely known as a Fed "dove," meaning she favors keeping interest rates low as a way to stimulate the economy and promote job growth. Fed watchers generally expect that she would continue Bernanke's policies, and therefore, she represents continuity for the Fed. "Yellen is a qualified monetary economist with significant experience within the Fed system. Her appointment is less likely to rock markets in the transition period," said one survey participant. Summers' position on monetary policy is not quite as well known, but he has recently made critical comments about the Fed's bond-buying program, known as quantitative easing. Respondents also said they thought Yellen would be a better consensus-builder within the Fed, whereas a few expressed concerns about Summers' tendency to "put his foot in his mouth" and "poor reputation for not being a team player." "Summers is likely to be the brightest person in whatever room he finds himself, but that does not mean he would be a good Fed chairman," one said. We also asked a few questions about gender, since it has been such a hot-button issue. The responses were strong. Most said the focus on gender wasn't fair to Yellen, whose credentials should stand on their own. "Gender is not a valid part of the conversation, and it's sort of embarrassing that there is so much focus on it rather than on the substantial differences between Yellen and Summers," said Jodi Beggs, a lecturer at Northeastern University and blogger behind Economists Do It With Models. "Gender should not be playing a role in this decision," said Catherine Mann, professor of global finance at Brandeis University. "The two candidates are both extremely well qualified if smarts were the only determining factor. Yellen is better for the job because she genuinely appreciates the role of the research staff in monetary policy-making." Other respondents criticized the media for even mentioning the gender issue. "Media coverage of this in recent days has substantially raised my blood pressure. Please, write about this responsibly!" one said, adding "when a woman DOES rise to near the top of the profession and is considered for a high-level position, there will be a contingent that immediately begins to claim she is only in the top pool because she is a woman. This is exactly what is happening now to Dr. Yellen." But the focus on Yellen's gender is part of a bigger issue. Women are greatly outnumbered by men in the field of economics. Only about a third of new economics Ph.Ds are women, according to the American Economic Association, but the disparity starts even earlier, in undergraduate education. In the top 100 universities, there are 2.5 male economics majors per female econ major, notes Claudia Goldin, Harvard economist and president of the American Economic Association. "If women are poorly represented in economics in the labor market it is largely because they do not major in the field," she said. "You can't easily make a Shakespeare expert or a gene splicer into an economist." But if Janet Yellen becomes the most powerful central banker in the world, perhaps more young women will decide to pursue a career in economics? "At the highest levels of central banking, there are very few women," she said. "But I am pleased that the representation of women is increasing a lot at other levels... I really think this is something that's going to increase over time, and it's time for that to happen." Images (from left to right): First row: Caroline Abel of Seychelles, Elvira Nabiullina of Russia, Zina Asankojoeva of Kyrgyz Republic, Edmee Betancourt of Venezuela, Gill Marcus of South Africa, Maria do Carmo Silveira of Sao Tome e Principe, Jorgovanka Tabaković of Serbia. Second row: Linah Mohohlo of Botswana, Rets'elisitsoe Adelaide Matlanyane of Lesotho, Mercedes Marco del Pont of Argentina, Nadezhda Ermakova of Belarus, Joyce Cocker Mafi of Tonga.